At the beginning of each year I like to do a quick review of "sales" over at DriveThruRPG. This helps me gauge my "work" over the previous 12 months and allows me to keep things in check with the initial goals I had when starting this effort. I think I'm right in line and while some goals may change over the course of 2015 (i.e. I have some plans I'm not announcing yet) at the core I want be able to give back to this hobby that has given me so much over the previous years. For some of you, these numbers may be surprising and for others it might be useful to have something to compare to.....just be aware that there that are going to be some discrepancies by design. None of these number incorporate the free Lunch Box Heroes game that was put up recently. 667 The number of "sold" products that were new in 2014. 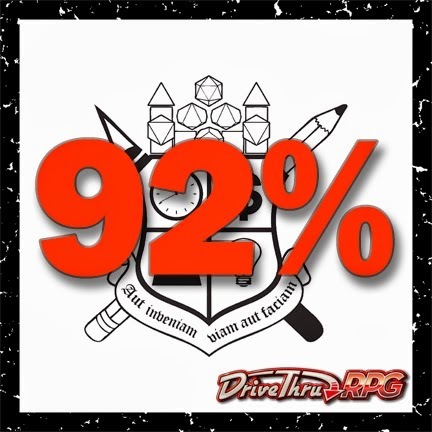 This means that 92% of everything downloaded from Frugal GM through DriveThruRPG was free. My overall goal was to hit at least 90% I think I've been successful in this regard. I'm a little disappointed in that there have only been three product reviews this year, but it's within the expected range of 350-400 downloads per review norm that has been established. The one thing I'm personally not happy with is that there were only seven new items released this year. While I didn't exactly have a goal in mind, I think I need to shoot for at least one a month. I do think things have been steadily progressing and as I find more free GM resources to post and more cool RPG products to review I like to think that this blog is slowly becoming a more valuable tool for my fellow GMs. Thank you for being a part of this endeavor and for helping more folks enjoy RPGs.